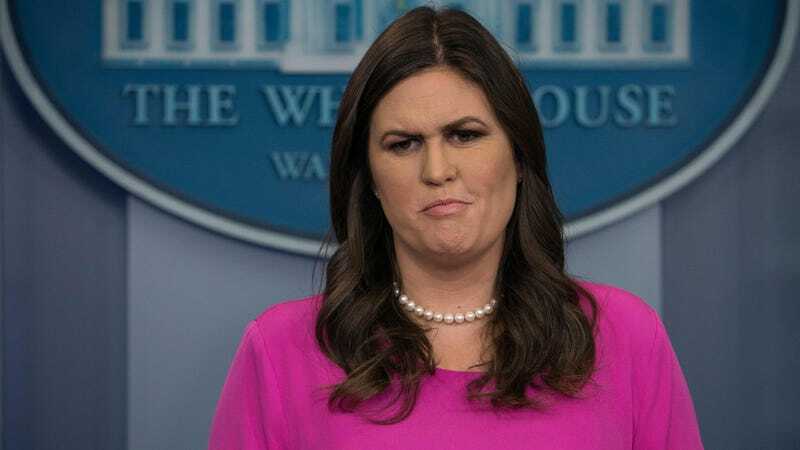 If only Sarah Huckabee Sanders didn’t have a face that only a customer retention specialist could love (and the moral compass of a comic-book henchwoman). Maybe we’d even feel a little sorry for her, and wonder what she does to relieve the stress that comes from lying on President Donald Trump’s behalf day after day. But, as was mentioned up top, she’s all in on this MAGA thing. And so it is with indifference tinged with spite that we report that Trump is once again too scared to attend a roast where the topic of his money is on the table, and thus Sanders will represent the administration at the head table of this year’s White House Correspondents’ Dinner. The WHCA adds that Trump is “actively encourag[ing]” other members of the administration to go as well. Trump also sat out last year’s Correspondents’ Dinner—the first president since Ronald Reagan, who was recovering from an assassination attempt at the time, to do so—opting instead to try out some new material of his own at a rally in Pennsylvania. There, he said, “maybe we’ll make it more exciting for them in Washington and show up” this year, a promise that, like so many others, turned out to be as empty as Trump’s Twitter drafts folder. Trump did attend another, lower-profile press event, the Gridiron Club dinner, last month, where he joked about Melania leaving him and made a crack about Maxine Waters needing to take an IQ test that one analyst called “incredibly racist.” Maybe it is best to leave this one to the professionals—comedians and punching bags alike. The Daily Show’s Michelle Wolf, who just signed a deal for her own late-night Netflix series, is set to host this year’s White House Correspondents’ Dinner, which will take place on April 28. As usual, it’ll air on C-SPAN, which means Trump won’t be watching unless he clicks over from Fox News by mistake.